The Reformation was introduced in the Danish-Norwegian kingdom in 1536, by a governmental decision. What were the Political, social and religious conditions in northern Norway – and in adjacent parts of northern Fennoscandia – at that time? How did these conditions contribute to the way the Reformation was implemented in the North? What more sustained processes were triggered by the Reformation? 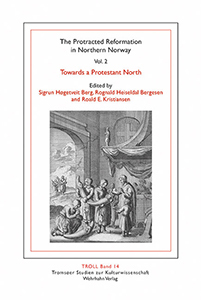 This second volume in a sequence of three books about the protracted reformation in the North offers some comparative approaches, such as developments in other regions of Fennoscandia, and drawing parallels to the Russian Church Reform of the 17th Century. Editors are Sigrun Høgetveit Berg, Rognald Heiseldal Bergesen and Roald Kristiansen at the University of Tromsø – Arctic University of Norway.